The benjolin is a multifunction synthesizer designed by Rob Hordijk. 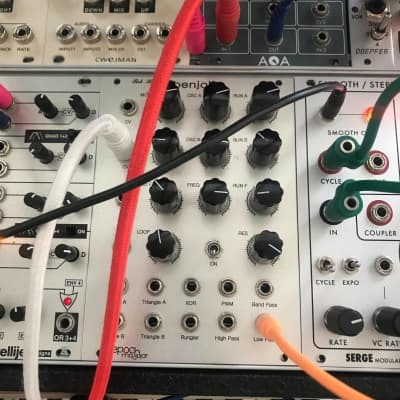 The module consists of four separate function blocks: two VCOs, a state variable filter and an additional circuit, invented by Hordijk himself, called a rungler. This particular arrangement emerged from Hordijk’s efforts to design a synthesizer that was, as he puts it, "bent by design". As such, the module functions according to principles of chaos theory, where short to long sputtering patterns spontaneously transform themselves, at times, gradually, at others, quite suddenly, morphing into new pattern doublings and bifurcations. The chaotic character of the benjolin is anchored in Hordijk’s rungler circuit. In essence, the rungler is an 8-step shift register that takes its data input from one oscillator (OSC A) and its clock input from the other (OSC B). The output of the shift register is then fed into a primitive, digital-to-analogue converter, creating a stepped voltage pattern of variable length and depth, what Hordijk terms a “stepped havoc wave”. This rungler wave is then wired back into the oscillators, via the attenuator knobs (Run A and Run B), creating the complex interference system that lends the benjolin its unique, aleatoric character. The inclusion of a voltage-controlled filter expands these possibilities further into the audio realm. Its design includes Hordijk’s signature, Z-plane modulation circuitry, which produces all-harmonic distortion. This gives the filter that kind of warm, organic character, reminiscent of classic tube amplifiers. This is most palpable when the resonance of the filter is turned to the maximum, with both oscillators running in the audio range. The filter’s input comprises a mix of a PWM wave (derived from the triangle waves of each oscillator) and the rungler signal itself. As with each of the oscillators, a rungler attenuator (RUN F) allows modulation of the filter as well. To round things out, CV inputs for both the oscillators and filter are normalized, each via their respective attenuators. This allows for cross modulation between the oscillators and a “sweeping” effect for the filter, hitched to Triangle B.